Vs. the Michigan Warriors the Tomahawks played some of their best hockey all season and took four out of four points on the weekend. On Friday and Saturday the Wenatchee Wild came to Johnstown and for most of both games, they dominated the play between the two teams. With that being said, Johnstown came away with three of four points. There's a saying in hockey, "Good teams find a way to win", and that's exactly what Johnstown did on Friday Night. 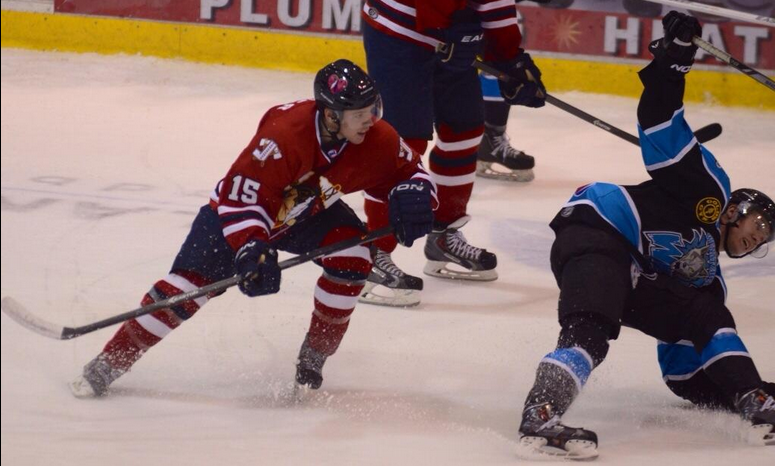 To follow it up, the Tomahawks battled on Saturday and was able to gain a point before losing the game in overtime. Alex Okicki stood on his head several times in both games, and deserves a lot of credit in extending the Tomahawks unbeaten in regulation streak to six games. If the match-up were vs. a North division team, the overtime loss would have hurt more than it did on Saturday night. The three points Johnstown gained this weekend moved them into second place. Point wise they are tied with Michigan, but due to having more wins, Johnstown get's the second spot. If the playoffs started today, Johnstown would face Michigan and have home ice advantage. When Michigan came into Johnstown two weeks ago, both teams battled as hard as you'll see two teams go after each other. Next weekend Johnstown travels to Michigan and with both teams now tied in points, we can only imagine it's going to be an all out war. Before we preview that match-up later this week we have to look at the Wenatchee series. Jordan Watt on Friday night scored another hat trick, and Joe Drabin scored a SportsCenter type of goal to give Johnstown the 4-3 win. Johnstown down 3-1 in the game on Friday, showed great heart to battle back, and being a resident of Johnstown Pa, you have to love that work ethic. This team is becoming something special and we hope they continue with their never die attitude. On Saturday night, Johnstown got the first goal of the game once again, but then Wenatchee turned it on and took control of the game from there. A story-line that seems to always be present is the terrible officiating. We're not fans that complain only when we get a penalty. The refs continually missed calls on both sides, or made the wrong ones. Everything from penalties, to icings, to offside calls. On Saturday night, the worst of them came at the 3:45 mark of the second period. A large scrum broke out behind the Tomahawks net, leading to three ejections, two of which were Tomahawks. Wenatchee's Mike Coyne was given five minutes for fighting and a game misconduct. Johnstown's Shane Bednard was given five minutes for fighting and a game misconduct. Matt Meier was given five minutes for leaving the bench and a game misconduct. Only problem, from what we saw, was that it was Meier's line on the ice to begin with, so his ejection is just mind blowing. Did Johnstown have extra guys on the ice? Yes. Cody Bentzel and Dakoda Menslage both were standing at the blue line, in a middle of a line change. If anything one of them should have been given the game misconduct, since they technically weren't on the ice when the scrum started. 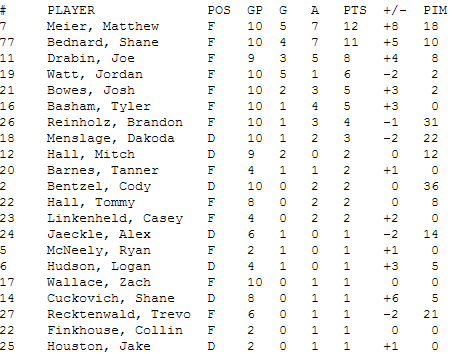 Instead, both Bednard and Meier were ejected, leaving two of Johnstown's top scorers out of the game, down 2-1. 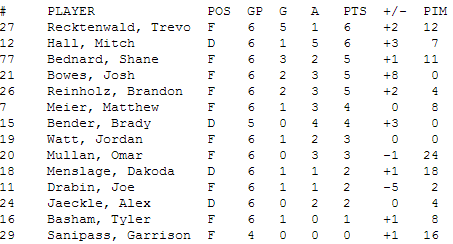 Johnstown though, continued to work hard, and in the third period it was all Johnstown out-shooting the Wild, 13-6. 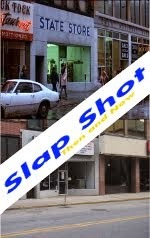 In the dying seconds, Menslage ripped a slapper from the blueline to tie the game. The building was rocking as the Tomahawks' looked to win the game in overtime. It didn't work out that way as Wenatchee scored 14 seconds into the overtime period. We had flashbacks of the playoffs last season vs. Port Huron, when the Fighting Falcons knocked the Tomahawks out of the playoffs in overtime. 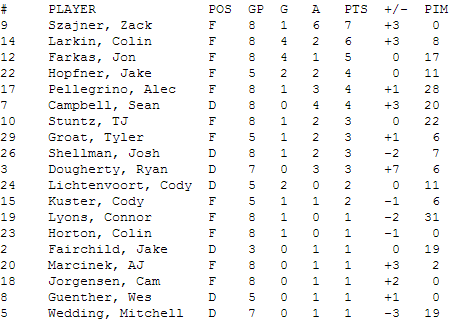 ALSO: Check out the update Alumni Stats from this past weekend's action. If you follow us on Twitter or Facebook this is something you've seen but for those that don't have social media accounts, we want to share this with you. 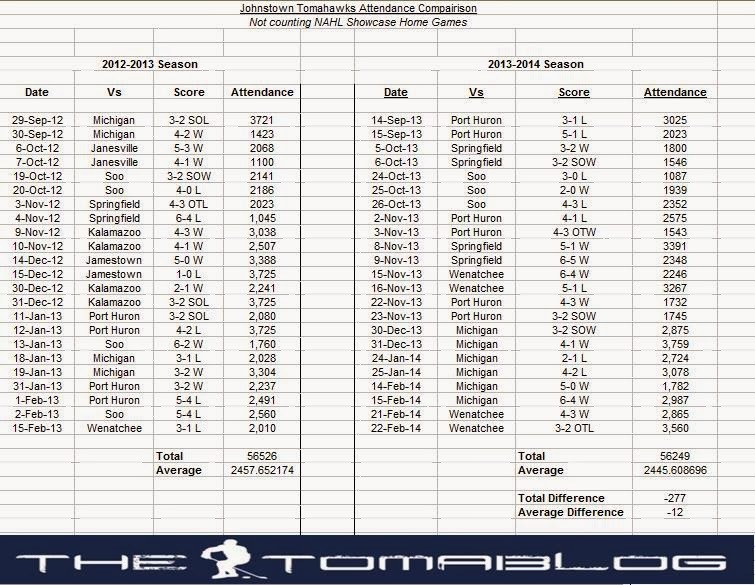 These are the Tomahawks' attendance numbers, this year compared to last years. This does not show the two home games the Tomahawks play in the NAHL Showcase Tournament at the beginning of the season. The Johnstown Tomahawks and Wenatchee Wild are getting ready to faceoff against each other for the last time this regular season. The two teams will have played a total of eight times after this weekend. Johnstown has yet to play in division Janesville Jets, and when they do they'll only play them a total of four times. But we're not complaining about having to play the Wild, as it's nice to see an out-of-division team come to Johnstown, and the two teams have built a nice little rivalry against each other. Both teams come into this weekend's pair of game with almost identical records. Wenatchee is 24-19-6 good for 54 points and fourth in the Midwest division. Johnstown has a record of 25-19-3 with 53 points, which is good for third in the North division. The games earlier this season where hard-hitting, fast-pace style of hockey. Now that the two team's seasons are winding down, and they're battling for better division placement, you can expect an all out war. Wenatchee is below .500 this season on the road with a record of 11-14-3, while Johnstown has played well in front of the home fans, holding a record of 14-8-1. Johnstown needs to make sure they play a disciplined game like they did last weekend against the Warriors as Wenatchee has the league's 3rd best power play (19.8%). Johnstown is on a three game winning streak and have at least a point in their last four games. Wenatchee is on a two game winning streak and have at least a point in their last three games. These two teams couldn't be anymore even matched. Here's a look at the previous meetings this season, and even in the head-to-head match-ups neither team has been able to dominate the other. This is also the first time Tanner Barnes and Omar Mullan face their former teams. Should be a great weekend of hockey in Johnstown. 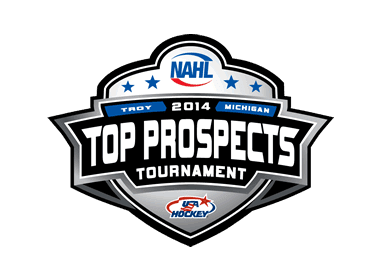 Today was the second day of the two day event for the NAHL Top Prospects Tournament. Yesterday the North division shutout the South, 3-0. Today the North was on the other side of things, dropping their game to the Midwest division, 4-1. 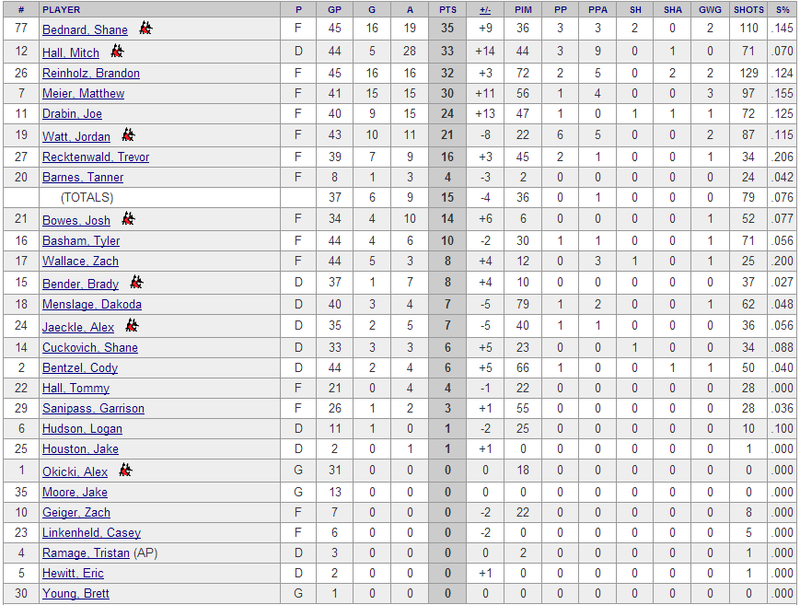 Reinholz, Hall, and Bentzel were all held shotless and were minus one in the game. 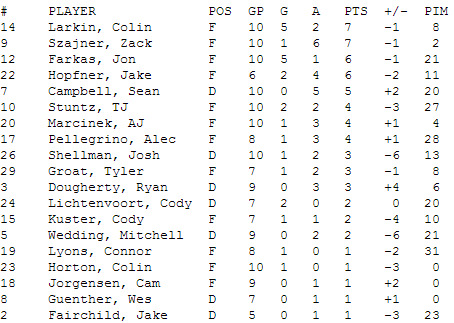 Former Tomahawks' forward, Omar Mullan was in the lineup for Midwest and had a better game for himself than he did yesterday. Today in his team's victory he had an assist, was a plus 3 and also had 3 shots on net. The North division once again had their two goalies spilt time in net. Today Springfield's Stefanos Lekkas started the game and played the first 30:08. He faced 9 shots and made 9 saves. Port Huron's Alex Blankenburg then played the rest of the game, making 6 saves on 8 shots picking up the loss for the North Division. In the first game of the day, the South division played against the Central division, with Central winning the game 3-2. Cody Gylling was playing for the South and didn't have any points in the game, was a minus 1 and had two shots on the net. Evan Hesse played for Central, and he also had no points in the game, but did record three shots on net. Hopefully in the next few days and weeks we'll hear that all three Tomahawks' have made college commitments, as all three players have deserved to play at the D1 level. Mitch Hall is having a career year this season already posting 33 points (5 goals, 28 assists) and is a plus 18 in 46 games. Last season, Tomahawks' top offensive defenseman was Casey Nelson. Nelson had 32 points in 52 games (10 goals, 22 assists) and was a minus 6. Brandon Reinholz has matured this season, keeping his temper under control this season. Last year he was ejected five times last season, four of which were from abuse of official penalties. This year he has yet to be ejected from a game. Reinholz has put up the same exact point totals this year as he did last year, only it's taken him less games to do it this year. In 47 games so far this season he has 32 points (16 goals, 16 assists). 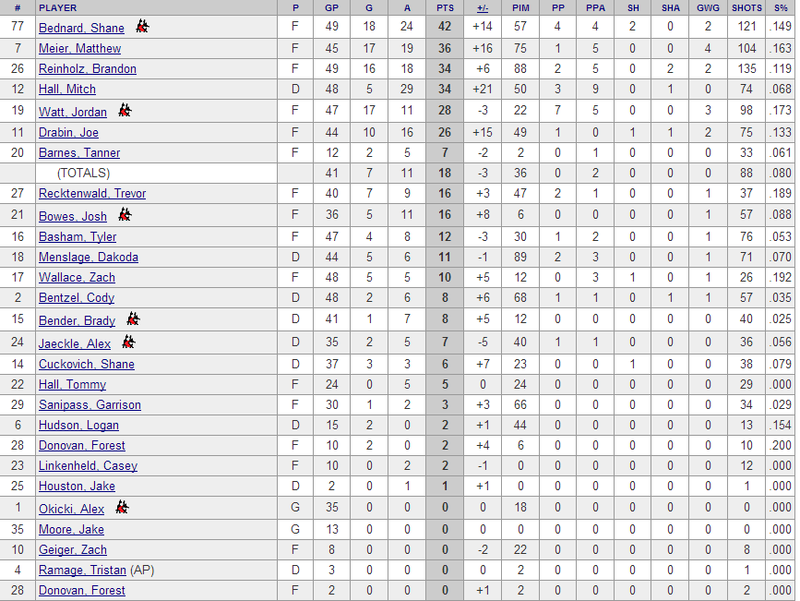 He's also a plus 5 this season, and has 88 penalty minutes. Last year he registered 32 points (19 goals, 13 assists) in 53 total games. He was a minus 2 and racked up 126 penalty minutes. Cody Bentzel has improved his offensive numbers over last season's totals, and has been a reliable d-man in his own zone. This season Bentzel has 8 points (2 goals, 6 assists) in 46 games. He's also a plus 7 and has 66 penalty minutes. Last year he had a total of 5 points (1 goal, 4 assists) in 50 games. He was a minus 2 and had 54 points. So far this season a total of three players have made college commitments. Jaeckle and Meier with Air Force, and Bednard with Bowling Green. The first day of the two day Top Prospects Tournament is in the books. Three games were played and featured current and former Johnstown Tomahawks. In the first game of the day, the North division took on the South division. The South outshot the North 48-25, but were shutout by the score of 3-0. Brandon Reinholz had a very good day, getting an assist on the first goal of the game, which was scored by Soo's Michael Sabatin. The second assist went to Janesville's Robin Hoglund. Then in the third period Reinholz scored the empty-net goal to make the game 3-0. The assists went to Sabatini and Robin Hoglund. Mitch Hall didn't register a point in the game and was an even on the ice. He did receive a two-minute penalty in the second period for interference. Cody Bentzel was also in the lineup for the North. He was an even on the day and didn't have any penalties. Both teams split the time in net with both their goalies. For the North, Port Huron's Alex Blankenburg started the game and played the first 29:57 minutes. He faced 18 shots, turning away all 18. Springfield's Stefanos Lekkas finished the game and turned away all 30 shots he faced. Cody Gylling appeared in the game for the south. He didn't have any points in the game, was a even rating, and had two shots on net. Tomorrow the North plays Midwest at 3:30pm. The middle game of the day saw the NAHL U18 Selects beat the HPHL team 3-0. No former Tomahawks competed in the game. The last game of the night saw Midwest take on the Central division, with Central winning the game 4-1. Former Johnstown Tomahawks' forward Omar Mullan played in the game for Midwest. Mullan didn't register a point and was minus three in the game. 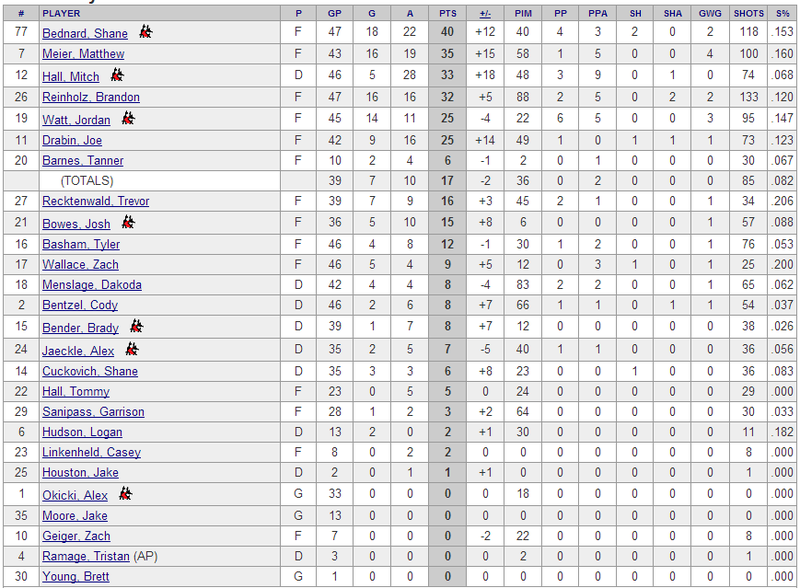 For the Central division team, former Tomahawks' forward Evan Hesse played but didn't have any points. He was a plus 1 and put two shots on the net. 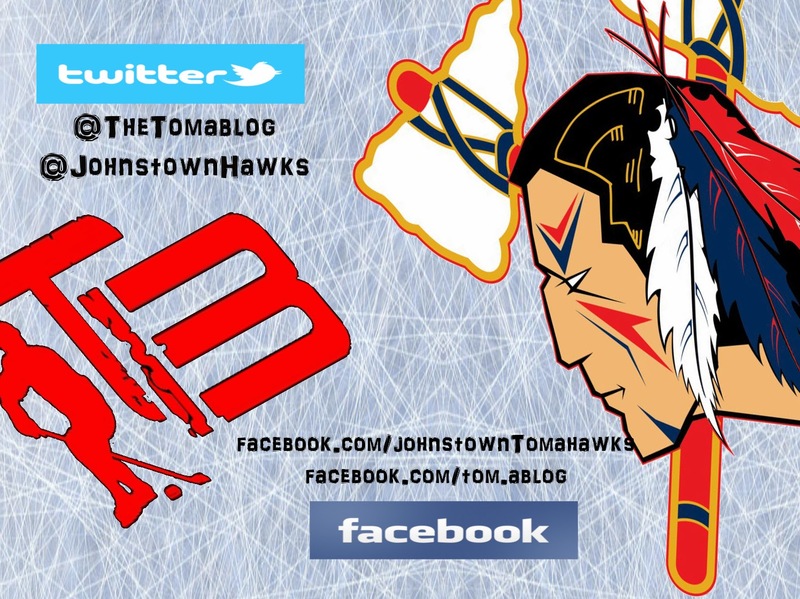 Johnstown is back at home and just like every game at home since December 30th, it's vs. the Michigan Warriors. Luckily, this is a two weekend homestand and next weekend the Wenatchee Wild will come to town. But we'll stay focused on Michigan right now. Michigan comes into the weekend second in the division with a record of 23-12-8 good for 54 points. Michigan comes into Johnstown on a 8-game winning streak. Johnstown comes into the weekend with a record of 23-19-3 good for 49 points. This isn't a long preview since we've played Michigan so many times, but below you'll find head to head stats, standings, and links to other stories from this past week. Springfield plays Port Huron and Janesville takes on Coulee Region. Two teams have been active in the North division as the trading deadline approaches. Janesville, the worst team in the division has been shipping players in and out, and the Fighting Falcons have also made a couple trades. One of their most recent trades is a familiar face. Port Huron sent Joey Lindberg to the Brookings Blizzard for Elliot Tisdale. Tisdale played last season for the Jamestown Ironmen. The Mars, Pa native appeared in 56 games for the Ironmen, scoring 6 points (4 goals, 2 assists) and 97 penalty minutes. During the off-season this year, Tisdale tried out for the Johnstown Tomahawks but did not make it to the team's main camp. 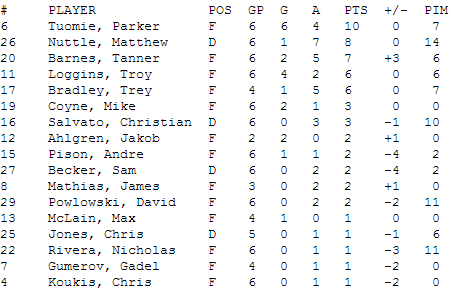 This season with Brookings, Tisdale had 8 points (3 goals, 5 assists) and 47 penalty minutes. Port Huron also traded Jeremy Briscoe to Lone Star. They acquired Jake McNamara from Corpus Christi. Johnstown and Port Huron don't face each other again this season, but could possibly face each other come playoff time. If interested you can read the team's press release on their latest trades here. February 10th is the NAHL's playoff roster deadline. All teams must have their final 23-man roster turned in by then. To get to that number, Johnstown had to free up a roster spot and have decided to go with two goalies for the rest of the season. Alex Okicki and Brett Young will be that tandem as the Tomahawks have released Jake Moore. You can read about the decision in the Tribune Democrat's article, in today's paper. The article features quotes from Head Coach Jason Spence on the transaction. 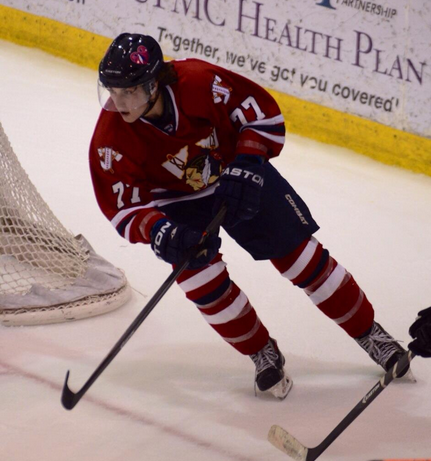 Jake Moore played in 13 games for the Tomahawks and had a record of 5-5-0. 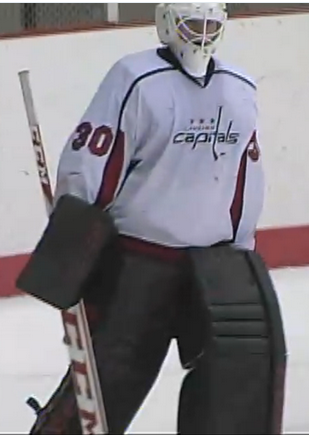 He had a GAA of 2.96 and a save percentage of .912. 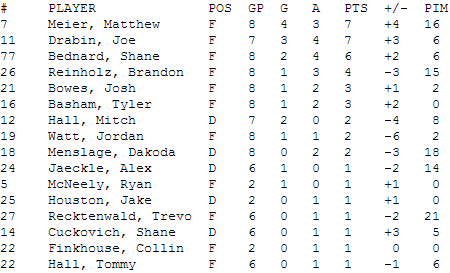 Also, on Monday the NAHL announced that the North Division Star of the week is Johnstown's own Mitch Hall. Last week Hall appeared in two games with four assists. In total this season, he has 33 points (5 goals, 28 assists) in 44 games. He's also a plus 14 which leads the team. Labels: Jake Moore, Johnstown Tomahawks, Mitch Hall, NAHL. The Tomahawks had to dig deep after going into a losing slide the last few weeks. When it was all over Johnstown picked up three of a possible four points. On Friday night, Brett Young made his first start since November 2nd, which was also vs. the Fighting Falcons. Young played an impressive game turning away 33 of 36 shots. Johnstown had the lead in the third period with less than two minutes to go, until Port Huron tied the game on the power play, sending the game to overtime. In overtime Nick Horne was able to get the game winner for Port Huron, beating Johnstown 3-2. Johnstown had goals from Zach Wallace, and Brandon Reinholz. Johnstown was 0 for 3 on the power play, and Port Huron was 1 for 5. Port Huron outshot Johnstown 36-27. On Saturday night, Johnstown continued to battle and played a full 60-minutes, and this time it paid off. Alex Okicki was in net for Johnstown stopping 32 of 34 shots. Johnstown did have a 2-1 lead after the first period. Tomahawks' first period goals came from Matt Meier, and Shane Bednard. Port Huron tied the game up halfway through the second period, and the game would stay tied at two going into the third period. In the third Johnstown got goals from Tyler Basham (game winner) and Shane Bednard (empty net). Johnstown was 0 for 2 on the power play, and Port Huron was 0 for 4. Port Huron outshot Johnstown 34-30. In net for Port Huron was Alex Blankenburg. On the season, he now has four regulation losses, three of which have come against the Tomahawks. Eric Hewitt played in both games this weekend. He did not register a point but was a plus 1 and had one shot on net. Port Huron had 662 people at the game on Friday night, and 368 on Saturday night. The Tomahawks booster club made the trip to Port Huron. Johnstown now has a record of 23-19-3, good for 3rd place. Johnstown has this upcoming weekend off and will be back in action the following weekend at home vs the Michigan Warriors. 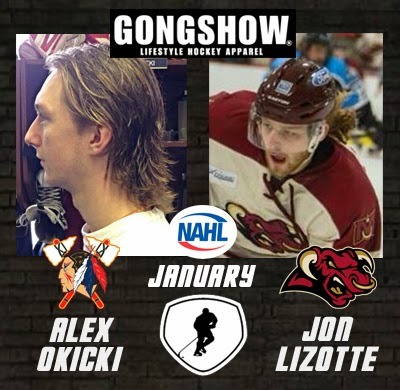 Alex Okicki was named winner of "Flow of the Month" for the month of January. He joins his teammate, Jordan Watt, who also won "Flow of the Month" honors for the month of December of this season. You can check out the NAHL announcement here. Another week of hockey is the books which can only mean one thing, we've updated the alumni page with the most up-to-date stats. You can take a look at those former Tomahawks' playing at the college and junior level here. Before the start of Friday night's game vs. the Port Huron Fighting Falcons, Port Huron announced some sad news, that the current assistant coach for the team had passed away. Scott Nichols was the team's goalie coach and a native of the Port Huron area. Here's an article from the Detroit News about the tragic story. The team has decided to play the rest of the season in Mr. Nichols honor. We, along with the rest of the hockey world, send our thoughts and prayers to the Nichols family and the Port Huron Fighting Falcons organization.